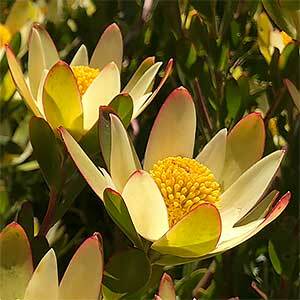 Leucadendron Harvest is a form of Leucadendron stelligerum, masses of creamy yellow flowers with the petal margins blushed with pink to red make this a standout variety. You could grow Leucadendron Harvest in a container, as a feature plant in the garden or use it as a low growing free flowering hedge. Frost and drought tolerant and ease of pruning make this a low maintenance low fuss Leucadendron variety once established. Best grown in a sunny position in a humus rich well drained soil. Dig the soil over well before planting adding some well rotted compost and a little aged cow manure. Plant at the same depth as it was in the container. Water in with liquid seaweed fertiliser. Much around the plant to maintain cool root run and help suppress weeds. Fertilise each year with a low phosphate fertiliser. Prune back after flowering leaving 10 kms of good foliage on each stem. 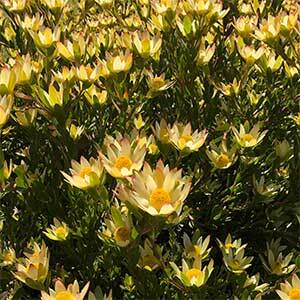 Common Name – Leucadendron Harvest. Height – To around .75m in height. Spread – To around .75m in width. Flowers – Creamy yellow with pink to red margins.